casa pura Premium Entry Mat | Entrance Mat Comparison Test Score: Very Good (A-/1.3) | Ideal as Front Door Mat or Entry Rug | Charcoal Gray - 54" x 80"
casa pura Premium Entrance Floor Mat - the No. 1 dirt trapping solution for stopping dirt, mud, and wet before it reaches your floor. These premium quality front door mats come with an absorbent soft polypropylene pile that catches wet, dry and even greasy dirt from shoes, wheels and paws. Highly absorbent fibers are specially designed to get deep into the crevices of shoes and are able to trap up to 330 oz. of dirt and 200 oz. of wet, making it the No. 1 solution for home, garden and commercial entrances. Each entry rug can be easily cleaned with a hoover and is washable at 30°C / 86 °F. 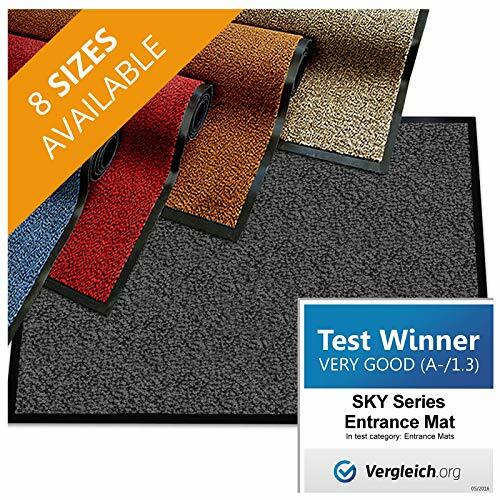 They are designed to be UV-resistant and are equipped with a non-slip, anti-skid durable backing that will stop the floor mat from moving or slipping when in use, making it a perfect all weather entryway rug. Rubber backed polypropylene entrance rugs have significant advantages compared to standard cotton front door mats. While being slightly less absorbent when it comes to the retention of water, they have superior dirt, grease and mud trapping capabilities and are more hard-wearing and more attractively priced than their cotton counterparts. In addition, their rubber edging keeps the entry way floormat firmly in place and prevents trip hazards. Doormat is available in many sizes and colors to meet all demands - both home and industrial use. Please refer to the color and size drop-down menu at the top of this page.